Are you Borrowing... or is it Payback Time ? Student Loans: Invoice shock ? When your final loan invoice is presented... the shock sets in. Or maybe you're not there yet... You're not finished with college and you need a loan. Have you decided on a Federal Loan... maybe through Sallie Mae, the largest Federal lender. Perhaps you're looking for a private loan where many lenders compete for Federal Student Aid. Collateral is key but parents or grandparents can also help through home equity loans sometimes. It's always less costly to begin saving early... so when college or university time arrives... you've got it covered. However, that's usually hindsight or wishful thinking.. so let's review school loans and some options. Asumming you've borrowed and it's now payback time, you can't just toss that loan aside. Nearly all loans are accruing interest and must be paid back. 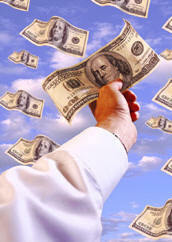 Some lenders have adopted new loan guidelines and innovative ways to reduce your payments and even your overall bill. With these student loan reduction ideas, you may be able to pay off your debt without hurting your everyday budget. You may even want to review student consolidation loans. When you're looking at a large student loan, you might be terrified at the prospect of having to start paying it off. Borrowers can usually find relief by bundling multiple loans into one new, fixed-rate loan. It's a lot like credit-card consolidation, your monthly payment is usually more manageable. There is a caution though - the overall costs can be higher because the term of your loan is often extended, which means you are paying interest for a longer period of time. You can take your school loans to any lender for consolidation... but because your current lender has all your paperwork it's often beneficial to start there. And this would be a good time to ask about any student loan forgiveness plans or if they refinance student loans. Then you can shop around for lenders that may have better customer service, lower interest rates or discounts for automatic payments. Here's how the repayment plan works. Under standard plans, student loan borrowers usually pay the highest monthly payments for 10 years. But for recent graduates... there is a "graduated plan" that starts out with lower payments and then increases every few years. There is a downside of course... you're just buying time with this plan because interest charges build up on your loans based on the unpaid balance. So, borrowers will pay more over time. Your FREE Guide to All U. S. Government Grants and Loans Benefiting Students! It's also possible to defer payments on student-loans for as long as three years if a student is unemployed and looking for a job, or if you're employed in certain professions, such as law enforcement or teaching. You don't pay interest on these subsidized or need-based loans in deferment. Another possibility to reduce or even pay off your loans, is through helping those in underserved areas. For example, teaching in some of the poverty stricken areas can actually help to pay off your loans entirely. Some new doctors will work in out of the way clinics for a few years to help pay off enormous loans. Of course, this does require that you are in a profession where you can serve those less fortunate. When you're in a business field that promotes continued learning, you might want to look into repaying your student loans with their resources. If you can prove that your education is going to help you with your profession and your success in that profession, you may be able to get partially reimbursed for your educational fees. But, with plenty of options to help you dig your way out of the debt, the light at the end of the tunnel isn't so far away. In fact, it might be closer than you think. Leave Student Loans and Select Your School Theme!